The advice we get this week is to make inner peace with our fears. Know that your worries and fears don’t control you nor your inner being, and that it’s important to feel peace from within. The week starts off with a sense of stability and empowerment. You could work well with others, get some extra money, or just feel content. As the week moves on we may feel restless or that things aren’t moving fast enough. Some things might come up that push you into worry; the messages gently remind us that we are protected, being helped and being guided at all times. Focus on feeling peaceful this week to soothe your emotions and mind. The messages are simple and sweet this week! It is about stabilizing and grounding yourself. It’s a good week not to overload yourself, and to take things lightly. Don’t add to your workload or take on more than you need. Self-care is important, and keeping both feet on the ground. It’s also a good week to connect to your physical body. The weekend looks joyful, with a full moon marking the end of a cycle and things coming to culmination. Steadying yourself and taking a strong pace is essential this week, and indeed know that you are moving forward. Card Decks: “Healing with the Fairies Oracle Cards” by Doreen Virtue and “The Power Animal Oracle Cards” by Steven Farmer. This week we are encouraged to expand upon the familiar in order to ground and stabilize our energy! There is a lot of opportunity within what we already know. We start off the week by taking charge! What can we adjust, shift or discover that will uplift our energy? The middle of the week gives a renewal in our energy and perspectives, and positive outcomes and balance are to be expected, especially in our day-to-day routines. The weekend encourages you to let go of control, and more importantly, let go of attachment to outcomes. You don’t have to worry about how things will turn out; you are being watched over, and all you have to focus on is your own self-care and self-respect this week. This week is full of expansion, especially in your heart consciousness! Slow and steady wins the race this week. The main message is to gain your energy and your sense of self back. This is a week of slow healing, acceptance, and settling down. The beginning of the week focuses on self-nourishment and all aspects of your health. Take your time; there is no rush! The middle of the week focuses on connecting with your higher self and settling your energy. Your vigor and enthusiasm starts to return by the weekend. Let yourself glow from the inside this week. Stay out of conflict, find some solitude, and let yourself grow! This is a month to transition, and you will be very aware of it! Arguments and miscommunications will fade away and instead you’ll focus on your inspiration and resources. These conflicts are actually reflections of feeling disconnected from yourself; once you deepen your connection, your life will become more flexible. It’s time focus on what is important to you, who you truly are, and trust in your path. Follow your heart this month, and let go of the outcomes. Focus on the journey, and how to develop your relationship with yourself. If you feel insecure about your future, this month you can take your time to figure things out. Trust in the process, stay out of conflict, and use the energy of this month to press the ‘reset’ button. This month’s message comes from Buddha, or Prince Goutama Siddhartha. 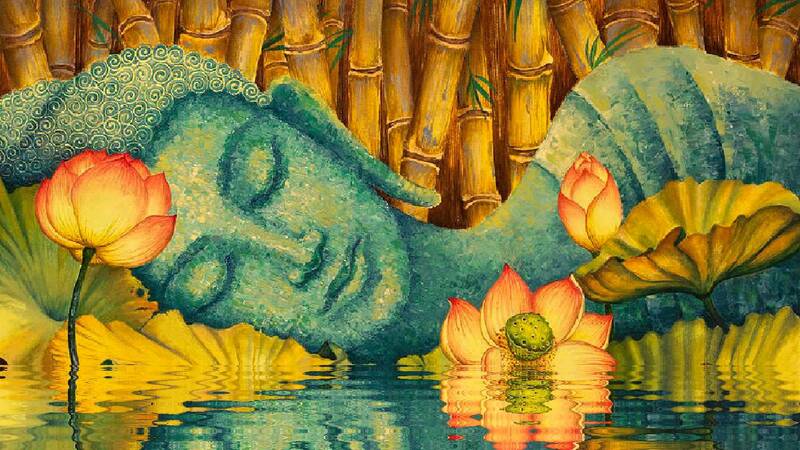 Buddha isn’t much of a talker; instead, he surrounds you with immense love, joy and peace. Lots of royal blue and lemon yellow swirl in his aura, and he smiles endlessly. His frequency is very high, and it took me a few hours of preparation and meditation to connect with him. He is always connecting lower energies with love energy, muting the harsh and bringing inspiration. He is constantly around and always everywhere, spreading joy and peace wherever he goes. I have never connected with someone who was so in LOVE with his own existence. Buddha is incredibly grateful and enamored by his own entity in the humblest way possible; he exists on both an individual and a collective level. He showed me some amazing things, such as how he devotes so much of himself to creating “frequency tubes” or hoses that connect lower dimensions with higher dimensions in order to filter love down into the lower dimensions. He wishes to assist us in our spiritual growth by infusing our energy with love and joy, reactivating a switch within us that helps us access these energies more easily; basically, he amplifies the signal that is already within us. He connected one of these ‘hoses’ or tubes to the base of my neck, explaining that when the nervous system is relaxed first, all other energetic portals of your body are open to love. The tube was bright, golden, and fizzy, like a solid tube of electricity. The instant he connected it to my neck and spine, I slumped back in my chair, as if I had lost all control over my body. I was immediately transported to a space of infinite love and joy, and I saw many images and revelations. One of the most interesting things was seeing all the faces of all the people I have ever loved in all my lifetimes in rapid fashion; I saw one after the other for barely half a second, it seemed, and yet it also felt like it lasted for hours. Buddha’s message this month is very short. He is more interested in connecting with your energy to expand your sense of self-love and inner peace. If you choose to do so, I recommend laying down on a bed or a mat, so that you don’t fall over as I almost did! Breathe deeply and meditate, asking Buddha to connect with you and thanking him for his connection. He will bring you one of his energetic tubes to help relax you, and you can give him permission to connect it with you if you wish. April is a month of putting your relationship with yourself first, and Buddha will help you do this. Your higher mind and self are waiting to be inspired, and I feel a lot of support for us this month if we set out to do so. If you are looking to make changes, it is time to start asking yourself the ‘why’ before the ‘how’, and then go about making those changes, always with self-love in mind. Create your own way. If you are asking yourself questions, questioning your being, your existence, your thoughts, your actions, your feelings, then you are on the right path. If you feel unsettled and restless, or lethargic and unmotivated, then it is time for you to start asking yourself questions. The most important thing you can ask is not a question itself, but rather a feeling of a thought that relates to your existence. This isn’t about what you want, but who you are. Asking what you want is a stepping stone that leads to the heart of the bigger question, and now it is your time to discover that question, as it may appear different for everyone, even though it is the same in its essence. Now is the time to wonder about yourself. Do not settle for one answer to any of your questions, but let the answers continuously flow to you to increase and extend your awareness. Who you are, how you exist, what you create: these are all flowering components of you, all different aspects that are connected into one beautiful and infinite energy. You can either lift your frequency or bring it down again: it is up to you. What I want you to remember, dear ones, is to ask yourself in everything you do, “How is this uplifting for me?” and proceed accordingly. Focus on uplifting yourself higher and higher, until you are floating with ease on a frequency of love.